My Voice Controller allows you to emulate mouse and keyboard inputs by using your voice. Common uses for this software are gaming and assistance for the disabled/injured. I wrote this program to assist me with playing various games including World of Warcraft. The software is free. The software is compatible with Windows XP, Vista, Windows 7 and Windows 8. •	Many more features available. See the profile commands section of this document. CODE: Help file (PDF) is now included with download. CODE: Isolated auto-it code to enable only when auto-it commands are used. No longer requires Auto-It to be installed. CODE: Converted to Visual Basic 2010 from 2008. NEW FEATURE: Added displaying the update changelog when a new update is available. BUGFIX: Reattached project code to a new project to remove legacy issues. NEW COMMAND: MOUSEADD - Adds/Subtracts X,Y from all mouse position commands. Useful for screen resolution changes or wow window moves. NEW COMMAND: WEBBROWSER - Opens a web browser window with the selected URL. This is useful for voice recognition on flash games where you don't want browser controlls interfering with your game. NEW FEATURE: Associate .MVC files with My Voice Controller. Voice profiles can now be loaded/changed by clicking on the file in windows explorer. NEW FEATURE: Check for updates to MVC. Located in the help menu. NEW FEATURE: Commands tab now displays commands in a grid instead of a textbox for readability. CODE: My Voice Controller can now only be loaded once in memory. NEW FEATURE: On Top button to keep My Voice Controller on top of other windows. NEW COMMAND: RUNEXTERNAL - Allows launching external programs/files. See default file for examples. NEW COMMAND: SPEAK - Allows text to speech. See default file for examples. NEW COMMAND: !FORMAT=|(:). Note, imported profiles must be in the same format as the main profile. NEW FEATURE: Nested macros. Now you may refer to macros within macros. BUGFIX: Removed UTF-8 Encoding on first line if exists. Converted priest and default files to new profile formats. BUGFIX: Options menu. The cancel button is working again. BUGFIX: Options menu. The text editor field is visable again. NEW FUNCTION: IMPORT – adds a profile to the existing profile. This is useful if you have one main profile with generic commands available for all your profiles and several other profiles that you switch between often. NOTE: commands and macros in the imported file will overwrite any commands and macros that exist in the main profile. Also the imported profiles must be in the same directory as the main profile. BUGFIX: Auto refresh profile was not working. Added file "priest - healbot.txt"
CODE: Option changes made are now saved after exiting the options dialog box and not when program is closed. CODE: Added error trapping for bad commands. They must now contain a | on the line. Please ignore my first reply. I had a look at the debug window of MVC an found the solution there. Obviously I used an incorrect syntax in one of the lines. Everything worked fine until the installation of patch 6.0.2. 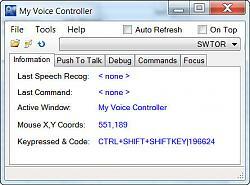 Since then the voice commands end in the MVC window and don´t reach the WoW window any more. Does anyone have the same problem or - better - found a solution? I assume I just drop all the file into the /AddOn directory path.. but How would I load the program in WoW? /mvc ? Please advise. The files can be placed anywhere on your computer. Once you run the program it is available to all programs in windows. Am I the only one not getting this to work? I have done all the instructions but its just not working. I cant even edit anything. View this page for the prerequisite files that may be needed for your version of the windows. Last edited by Sauron99 : 03-04-11 at 04:02 PM. A nice update! Thank you! 2) With a program like this, I worry. I've noticed that it uses automated functionality, even if that functionality is only telling the mouse cursor to go to a certain place, and to send clicks. If I remember correctly, Blizz get pissed off about things that emulate hardware events. :/ I wonder what their official stance is on this, perhaps we should ask on the forums? So on the one hand, I'd love to use this, it'd be so helpful. On the other hand, it might get one banned. Blizzard has posted officially that as long as YOU are in control, and not the script, using this is fine. 1) This is wonderful because it does aid handicapped people, my reaction times aren't that fast due to my sight being poor. In fact, I'm often blithering and looking for my cursor when I should be playing. This would help make me a more competent gamer, and that would be grand. You can heal through karazhan without using a mouse and keyboard. Nice for those days you feel like being lazy. I am totally impressed by your effort to give the handicapped a little tool to catch up! And that you give away the source code is definitley great. You even did not forget to write some documentation! This is exemplary! 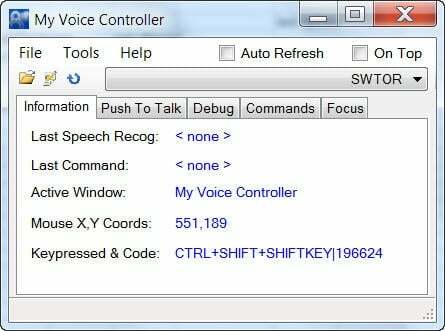 I am sure I will try your VoiceController (which I would not do if you had not released the source ;-) to hopefully make some tasks in WoW easier for me, as I am handicapped myself. I am going to request the source code at the given URL asap! In ancient WoW history I used the ingenious "AutoRogue" addon to help me play my rogue char quite successfully, but since this does not work anymore due to API restrictions introduced later, I am searching for any help I could get. First the Logitech G15 Keyboard does help me a lot. I use the special function keys to get access to my actionbar buttons more directly than it was possible with the usual keyboard layout. Second I wrote a lot of macros to help me script some common tasks of my chars. Third I use a big bunch of addons to make life easier, to get functionality where I need it. Thank you for adding a new dimension - the voice - to controlling WoW. Ok, I won't use it if I am playing in a party, they would probably not like hearing me shouting something like "sap! sap!" all the time! LOL!